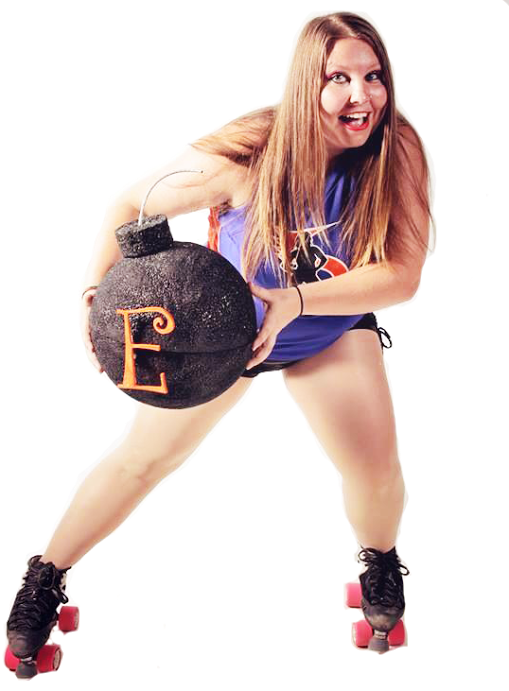 As the store bells ring on the doors of Oklahoma’s only roller derby skate shop, a bright, genuine smile blossoms across 27-year-old Emily Schorr’s face. She’s earned this smile. Her life has rapidly changed — through bad times and good — and through her passion for an ever-growing and changing way of life, her smile represents the happy lifestyle she has made for herself. Schorr, or E-Bomb as she is known as in the roller derby world, said roller derby served as an outlet for her when her mother died of colon cancer in March of this year. “It was a really hard time in my life,” Schorr said, her green eyes swelling with emotion. Schorr said when her mother was diagnosed, “I kind of just avoided life for a year. Things completely changed, Schorr said. She said roller derby was her saving grace. “Playing roller derby helped me through a lot of the things I was dealing with,” she said. That is just what Schorr has done. “[Roller derby] has genuinely made me a happier person,” she said. “I feel like I’ve found a place in the world where I belong. Schorr said she had always been a fan of the sport and finally got the courage to try it out. She started the new recruit process with the Oklahoma City Roller Derby league in August 2011 and made it onto her first team in March 2012. OKCRD is one of three women’s roller derby leagues in the state. Schorr made the OKCRD’s B team, the Lightning Broads. She now plays for the all-star team. “I’ve had a connection with roller derby that I never had with basketball or baseball,” Schorr said. “If I could do roller derby for the rest of my life and get paid to do it, that would be my career,” Schorr said. Schorr’s husband, Aaron Anderson, said he has seen first hand how roller derby has affected her. Anderson is a member of the OKC Wolf Pack, the only men’s roller derby league in Oklahoma. That push is just the thing that led to Schorr’s decision to take over Switchblade Skate Co., located at 2132 S I-240 Service Road, in her efforts to keep the roller derby scene alive. “Just the community, in general, is so accepting,” she said. “I just feel good about all of roller derby. Schorr works full time at Starbucks, part-time at Switchblade Skate Co., and is a part-time student at OCCC on top of her dedication to her team. Despite her busy schedule, Schorr said buying the store has been a rewarding decision. “I get to interact with a lot of different skaters from all over,” she said. Schorr, public relations major, said her focus right now is to graduate from OCCC in December of this year. From there, she plans to make a decision about whether or not she’d like to expand her business from a hobby to a career. For more information about the store, email emily@switchbladeskate.com or visit http://switchbladeskate.com. To follow Schorr’s skating career, visit her Facebook page at www.facebook.com/ebtotheomb.